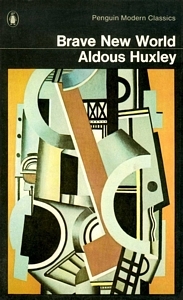 Aldous Huxley’s 1932 classic Brave New World is a satire on a world that has banished tragedy. A totalitarian state has imposed ‘social stability’ on an England with a mixture of relaxing drugs, somatic stimuli and official Voices cajoling and reprimanding the people who have been reduced to overgrown babies. No one is allowed to read Shakespeare, and all the great art of the past has been declared unintelligible and useless. Belief in God has been replaced by believe in Ford. Intellectuals like Helmholz Watson who challenge the stupefying new order risk banishment to an island. Lenina Crowne doesn’t see anything wrong with how things are. Nor will Polly Trotsky when she grows up. Bernard Marx does, but he’s too much of a coward ultimately to rebel. You get the idea behind the names: Huxley thinks this is the kind of dystopia society threatens to turn into under the influences of Materialism, Marxism and Soviet Communism. Huxley, whose generation struggled to deal with the impact of new technology on mass culture, imagined the worst outcomes for the media, with recorded images and music used to subdue the population into a dumbed-down mass. Also banished was romantic love, for that could lead to tragedy, and normal reproduction, for that could lead, equally, to deep human bonds. Huxley kept the scenario of this transformed England familiar by referring to real geographical locations and institutions, like the road to Portsmouth and the Archbishop of Canterbury, only to show them transformed into a wasteland in which people travel everywhere by helicopter through a nature they no longer notice, encouraged by an Archsongster by sing Gorgy Porgy Pudding and Pie. Into this scenario comes The Savage, the illegitimate son of a citizen who went astray. He exposes how unbearable this brave new world is for a man who still understands Shakespeare and believes in integrity and conscience and lust and love. When John Savage retreats to the remote countryside the dumbed-down mass treats him as a freak and makes a tv programme about him. Dumbed-downers come to gawp. The Savage’s life is unbearable. News this week that 19-year-old Maximilan Bromage killed himself in August 2012 after reading Brave New World, leaving the book for others to find and make the connection with John Savage, was more than a little extraordinary, since the message was clearly that our present society resembles Huxley’s worst fears come true. It’s not Communism that’s done the trick but the marketization and meditization of everything. Advanced science also raises huge problems. Why is it, for instance, that the passion for plastic surgery is not seen as an ethical aberration but something chic to save up for? In the past intellectuals used to worry about dumbing-down and a culture dominated by showbizz imagery but under New Labour they all caved in, under the ready illusion that doing away with high culture and replacing it with business might have something to do with equality. Now we get the same thing from the Tories the intellectuals start to protest, but it’s too late for Max Bromage, who surely felt he didn’t have any allies in a world long since suffused with the anti-values of daytime television. 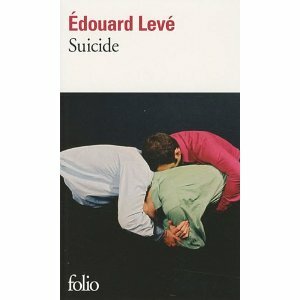 Bromage’s suicide scenario reminds me of a comparable case in France a couple of years ago, when novelist Édouard Levé wrote a novel called Suicide, delivered it to his publishers and killed himself ten days later. He left behind a finely wrought text, of which the last words were: ‘This egoism that was your suicide didn’t please you, but on balance to find peace carried the day over the painful agitation of your life.’ The sentence is more beautiful than this rough translation can suggest. This entry was posted in Writing and tagged literature, News, Novels. Bookmark the permalink.